California’s oldest seaside resort is warming up for an exciting eco-friendly winter event with the installation of iSKATE Capitola – Santa Cruz County’s first synthetic ice skating rink. 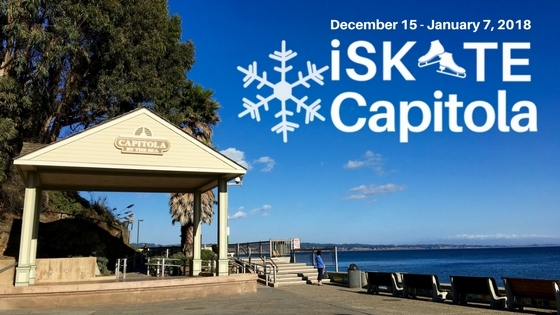 iSKATE provides an open-air rink located in front of the stage at Capitola Village’s Esplanade Park. From December 15, 2017 through January 7, 2018, visitors and locals can lace up their ice skates and look out over the beautiful Capitola Beach and Monterey Bay as they glide around the seaside skating rink. The rink highlights Capitola’s celebrated traditions of community spirit, seasonal events, and innovative approaches. Corrie Sid, owner of the Capitola Hotel, is one among many locals working to bring attention to the Village’s unique history and culture through new opportunities. Built in 1933, the old Capitola Roller Rink once stood on the property where the Capitola Hotel is now located. Through iSKATE, Sid and other inspired members of the community honor that pastime by introducing a similar experience with contemporary features. Unlike most conventional ice rinks that are known to result in high water waste and energy costs, the iSKATE rink is consciously designed to give visitors the same feeling as skating on real ice without the risk of harm to people or the environment. This 30 by 40 feet outdoor skating rink is made of synthetic ice. The material is constructed of interlocking panels of a high-tech plastic polymer that is treated with a water based food grade propylene glycol commonly used in food products. 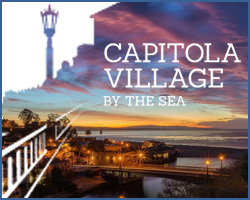 Since it was established as a resort town in the early 1900s, Capitola has continued to offer year-round events that have people flocking to the Village to experience all things new and nostalgic. The Village is enchanting every season, but perhaps most magical in winter when the shops, restaurants, and houses light up with decorations and it transforms into a festive beachside North Pole. iSKATE Capitola holds up to 40 skaters per session and runs three skating sessions per day Monday through Sunday, from 10am to 12noon, 2pm to 4pm, and 6pm to 8pm. Admission and skate time are on a first come first serve basis. Admission is $10 and ice skate rentals are $5 or you are welcome to bring your own. Tickets are available at the ice rink ticket booth or purchase tickets in advance HERE.